The data is clear, telehealth is popular among patients and they are increasingly choosing providers who offer the option of video visits. In fact, as many as one in five insist on it when selecting a provider. 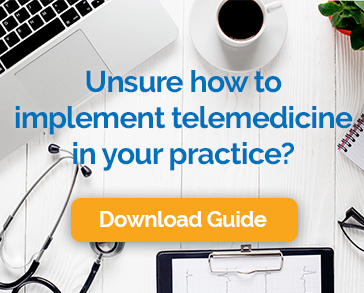 Medical practices also benefit from the introduction of telehealth technology by way of more flexibility, increased revenue, reduced costs and a more balanced division of work and life. The convenience and business advantages of telehealth are only worthwhile, of course, if they help keep patients healthy with safe and effective treatment. The good news is that telemedicine can improve patient outcomes, helping to make them happy and healthy at the same time. Here are some of the ways telemedicine can promote improved health. Chronic conditions like diabetes, irritable bowel disease, multiple sclerosis, and others affect about 133 million people in the US, according to the National Health Council. That’s more than 40% of the total population. Managing a chronic condition can be a burden on patients who are already dealing with the illness itself. Video visits reduce the amount of effort and time that patients must devote to their own care. This makes it easier for them to comply with treatment plans, improving their health as a result. In one study, the Veteran’s Administration was able to reduce the number of bed days of care by 25% and the number of in hospital admissions by 19% using home-based video visits. Even for those without a chronic condition, follow-up appointments after a visit for an acute condition are essential to ensuring that the proposed treatment is working as expected. However, it is all too common for patients to skip these visits because of the inconvenience and expense of going into the office. The option of a video encounter for follow-up improves compliance with aftercare recommendations and makes it possible for providers to ensure that the right treatment has been prescribed. After a patient has a laboratory workup, diagnostic imaging, or other medical tests, it is important that the results and subsequent treatment, if needed, are explained to the patient. It is common that these results are reviewed over the telephone. However, communicating complex and important information in a way that patients understand can be difficult without a face-to-face interaction. Telemedicine is the perfect solution for improving the quality of the communication without forcing the patient to make another trip to the office. It also has the added benefit of being reimbursable, whereas most telephone encounters are not. Studies have proven that telemedicine is a safe and effective way to treat depression and other mental health conditions. Video visits can be a great alternative for patients who are unwilling or unable to seek in-person care. They eliminate concerns about privacy and allow providers to see more patients each day, more efficiently leveraging the scarce number of providers who offer this type of care. Telemedicine has also been used successfully in the treatment of PTSD, with no loss of effectiveness vs. in-office care. Once a patient has been prescribed a medication, whether it is for a short time or for the long-term, it is important to monitor the results to ensure that the medication is working as anticipated and that there are no unexpected side effects. Often, however, the barriers to an in-person visit, such as missed time from work, the time and expense of travel, and other concerns keep patients from this important follow-up. They might needlessly suffer side effects or stop taking the medicine without a consultation. Remote visits are quick and easy and perfect for periodic check-ins for people taking prescription medicines. After an admission to the hospital, it can be difficult or even inadvisable for the patient to travel to the office for important follow-up care and advice. Video visits are the perfect way to ensure that the patient gets needed care without asking them to come in for a visit. The provider can make an assessment of the patient’s well-being and response to treatment and take steps to avoid an unnecessary, and expensive, readmission. In short, telemedicine allows for more face to face time with patients, it reduces barriers to treatment, allows for a more comprehensive treatment plan, and encourages patients to get care that they might otherwise forgo. The net result is healthier, more satisfied patients who are in a better position to manage their health over the long term. We talk a lot about how telehealth is convenient and cost effective for practices, but the ultimate goal is improved quality of care. Fortunately, that’s exactly what telemedicine has to offer.